The long awaited Dolphin 5.0 release happened in 2016 and thanks to a major cleaning up of the codebase Dolphin has reached a new level of efficiency, powered by a revitalized dynamic recompiler. Dolphin is considered by many to be the best Nintendo Wii emulator for PC you can find. It also works for Gamecube. We are running the official Dolphin 5.0 benchmark as it offers closer mapping to real world Dolphin performance as the previous version was extremely floating point heavy. We feel this is a pretty good general CPU benchmark for real world performance as emulation workloads are something that most gamers will run at one point or another. We benchmark the standard Wii homebrew application and run it with the speed limit set to ‘unlimited’ and the External Frame Buffer set to ‘real’ in case you wanted to run this on your personal system. Agisoft PhotoScan is a stand-alone software product that performs photogrammetric processing of 2D digital images and generates 3D spatial data to be used in GIS applications, cultural heritage documentation, and visual effects production as well as for indirect measurements of objects of various scales. We us the 50 images from the ‘Building‘ sample data download page for our benchmark. We take the total time it takes to complete four steps: Align Photos, Build Dense Cloud, Build Model, Build Texture with all the default settings for each. KeyShot 3D rendering and animation software is one of the fastest, easiest way to create amazing, photographic visuals of your 3D data. We installed KeyShot 6.3 to do some benchmarking and real-world stress testing using the camera_benchmark.bip scene that is included with the application. This benchmark tests a 800×554 pixel image with a continuous sample rate and shows the Frames Per Second (FPS) that the scene is being rendered from. This scene has nearly 42,000 triangles and does a good job at using all available cores to render the scene. Blender is the free and open source 3D creation suite. It supports the entirety of the 3D pipeline—modeling, rigging, animation, simulation, rendering, compositing and motion tracking, even video editing and game creation. 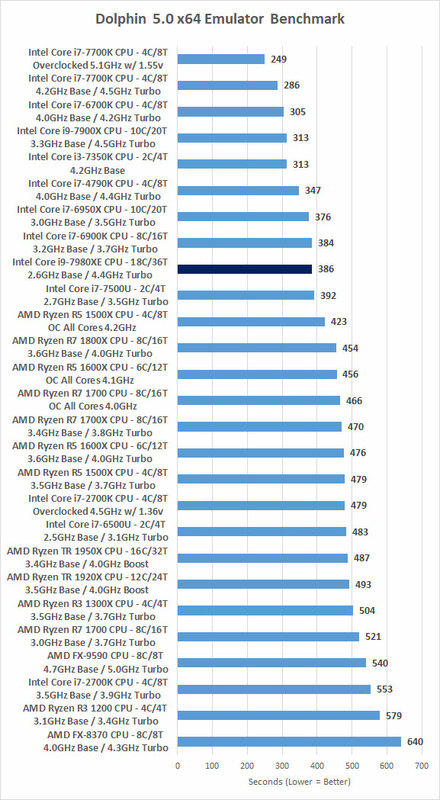 We use the BMW CPU Benchmark (CCO, 3MB) created by Mike Pan for our testing. 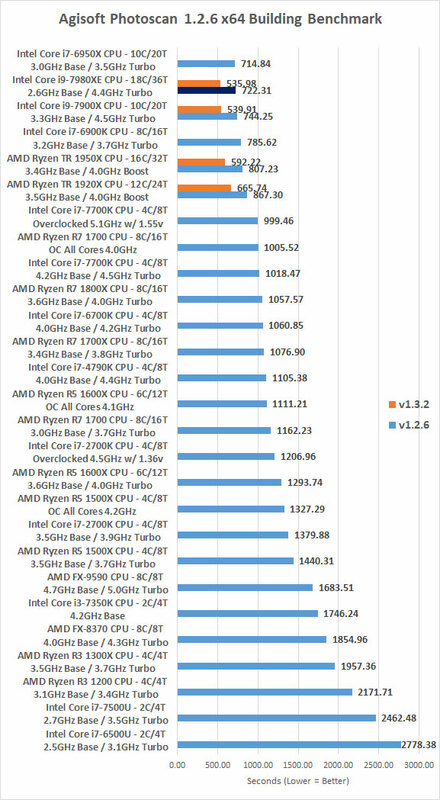 Real World Benchmark Results Summary: When it comes to our ‘real world’ benchmark tests we found the Intel Core i9-7980XE had some mixed results just like the Core i9-7900X that we looked at months ago. It dominated our Blender and Keyshot benchmarks, but fell short of the Core i7-6950X in Photoscan. The Dolphin emulator benchmark is very lightly threaded and core clock plays a huge roll in that benchmark, so it isn’t a big surprise that the 7980XE didn’t take the lead in that scenario.